On Monday 26 June we were given the use of the Information Point at the hospital. 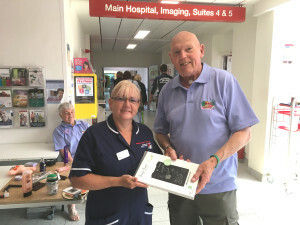 The picture shows Chairman, Ray Mountain presenting a boogie board to Head and Neck Nurse Practitioner, Mary Green. This device is for the use of any patient admitted onto Devonshire ward unable to communicate verbally, through being a laryngectomee, tracheostomee or for other reasons. A boogie board is a thin tablet with a liquid crystal display. You can write on it with a stylus or finger and wipe it clean in an instant using a delete button. It can assist communication between the patient and both their clinicians and families. We also raised some funds and promoted awareness of early signs of head and neck cancer. As usual at such days there were many valuable conversations with patients, visitors and staff.